I finished it last night - my chipboard drawer storage. I picked up one of those nut and bolt storage things at Lowe's and some white spray paint for plastic. I had to give them .92 cents more than my $25 gift card. that's pretty neat looking. 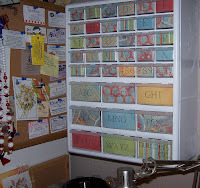 I have mine in tilt bins - and I never decorated the drawers -- or even labeled them (oops). Looks like I need to!